I spent a great weekend looking into Ski Holidays in Slovakia checking out ski resorts and accommodation in the Tatras Mountains. Although the skiing is not extensive there is enough for good skiers and free-riders to have a good short-break or for beginners/young families for the week. Transfer times are short and the hotels offer fantastic facilities including super wellness areas and good food at reasonable prices. To add to the fun there are some large water parks heated by thermal springs offering indoor and outdoor pools with slides and extensive wellness areas in the valley nearby. Your lift pass covers either a day on the slopes or entry to the water park offering a great alternative for young families or those wanting a break from skiing. Wizz Air offers flights from Luton to Poprad/Tatry in Slovakia for approximately £100 return. Poprad is very small, newly built and just 20 minutes away from Tatranska Lomnica and 50 minutes from Jasna. Wizz Air has flights on Saturday, Sunday, Tuesday and Thursday leaving Luton just after 2.00pm and departing Poprad at 18.15pm. 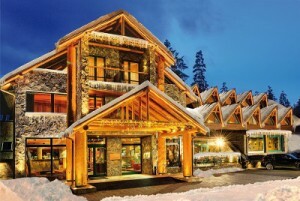 So you arrive in time to familiarize yourself with the resort and depart after skiing on the last day. Jasna, Low Tatras about 50 minutes from the Airport. 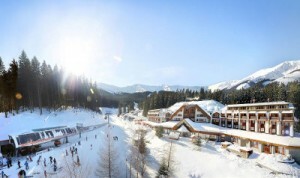 Jasna 1117m is the largest ski resort located on Mount Chopok at a height of 2024m. It has 46km (27km artificial) of assorted slopes (blue 20%, red 49%, black 21%) as well 12 free ride zones, a snowpark and Maxiland for young children. There are 4 cable lifts, 8 chair lifts and 18 tows. In the evenings enjoy night skiing, hotel wellness, partying at the Happy End Champagne bar and Nightclub or enjoy a 5 course meal up the mountain via piste-basher. Try out the small ice-rink, go to Tatralandia an enormous water park heated with thermal water and an extensive wellness area or try flying on a jet of air at Superfly (need to prebook). There is a ski-bus running during the day and there are some evening buses. There are also buses to the nearby town of Liptovsky and Tatralandia (about 30minutes away). Wellness Hotel Grand **** just across from the lifts, very nice rooms, large light modern lounge and restaurant with Wellness including indoor pool with massage jets, whirlpools and saunas indoor and outdoor and treatment rooms. Tri Studnicky Hotel **** 6km down the valley. A boutique hotel with a fabulous kitchen. A combination of rustic charm with stylish features and a Wellness area of indoor and outdoor whirlpools, saunas, relax and treatments rooms. There is a ski-bus running during the day and there are some evening buses that stop at both Tri Studnicky and Jasna Chalets. There are also buses to the nearby town of Liptovsky and Tatralandia (about 30minutes away). Tatranska Lomnica High Tatras about 20 minutes from the Airport. 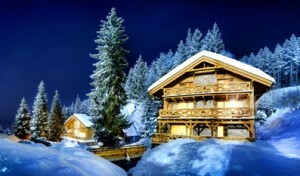 Tatranska Lomnica 850m has 9 lifts including new heated covered chairlifts. It offers 12 runs which are mainly blues and reds with one black run and a free ride zone. There are 11.9km of slopes 57% blues, 33% red and 10% black. The neighbouring resort Hrebienok 1285m has another 3 lifts offering 4 pistes green and blue including a 2.6km toboggan run lit at night. Enjoy the view from the restaurant at Lomnicky Stit 2634m the highest point accessible by Cable Car. Skalnate Pleso is at the top of the red runs with restaurant, view point and accessible by bubble. Enjoy an evening trip by piste basher with dinner and/or alternative ways of getting back down the slopes including toboggans or bike skis. 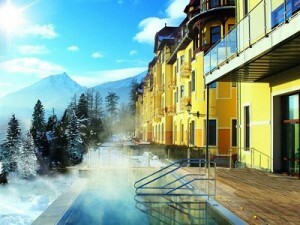 Grand Hotel Praha **** perched on the mountainside with far reaching views. A beautiful old style hotel with lovely rooms and modern bathrooms as well as a fantastic wellness area including indoor and outdoor pools. Excellent food is served in the traditional dining room. This entry was posted in Blog on February 9, 2015 by Mountain Beds.